Gabriel Fauré (1845–1924) was one of the most influential of French composers, linking the end of Romanticism with the beginnings of the modern era. His Requiem and Pavane remain among the best-loved classical pieces. Born in Pamiers in the south of France, Fauré's musical talent became apparent when he was a boy. "I grew up, a rather quiet well-behaved child, in an area of great beauty," he said. "But the only thing I remember really clearly is the harmonium in that little chapel. Every time I could get away I ran there...I played atrociously...but I do remember that I was happy; and if that is what it means to have a vocation, then it is a very pleasant thing." After graduating in 1865, Fauré earned a modest living as an organist and piano teacher. In October 1871, he was appointed choirmaster at the Église Saint-Sulpice, Paris (pictured), under the organist Widor. During some services, the two improvised simultaneously on the church's two organs, trying to catch each other out with sudden changes of key. 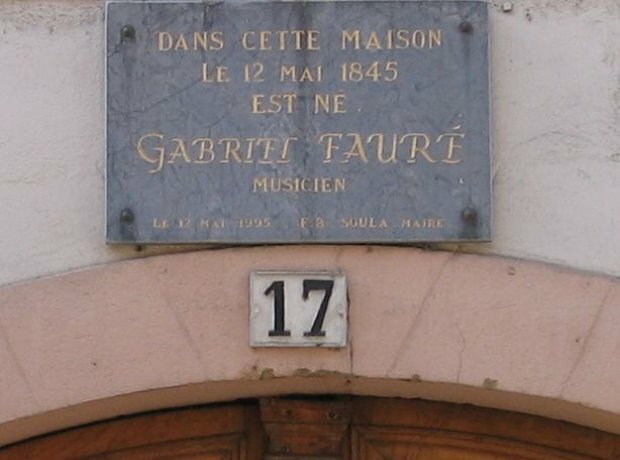 Fauré became a founding member of the Société Nationale de Musique, formed in February 1871 to promote new French music. Other members included Saint-Saëns, Bizet, Chabrier, Franck and Massenet. Many of Fauré's works were first presented at the Society's concerts. In January 1877, Fauré - aged 31 - had his first violin sonata performed at a Société Nationale concert with great success. It marked a turning-point in his composing career. Fauré greatly enjoyed foreign travel. From 1878, he made trips abroad to see the operas of Wagner (pictured). He saw the complete Ring Cycle in Munich and in London and Die Meistersinger and Parsifal at Bayreuth. Fauré admired Wagner and had a detailed knowledge of his music, but he was one of the few composers of his generation not to be influenced musically by Wagner. Holding an important post as organist as well as being director of the Paris Conservatoire meant that Fauré had to retreat to the countryside in the summer to concentrate on composing. He began his Requiem in 1887, revised and expanded it over the years, until its final version dating from 1901. Fauré said of his Requiem, "Everything I managed to entertain by way of religious illusion I put into my Requiem, which moreover is dominated from beginning to end by a very human feeling of faith in eternal rest." Fauré saw death as a "happy deliverance, an aspiration towards happiness above, rather than as a painful experience." In his late 40s, the married Fauré fell in love with Emma Bardac. The affair inspired a burst of creativity and a new originality in his music. Fauré wrote the Dolly Suite for piano duet between 1894 and 1897 and dedicated it to Bardac's daughter Hélène, known as "Dolly". Some people suspected that Fauré was Dolly's father. Fauré's popular Pavane was written for piano and choir in the late 1880s. He described it as "elegant, but not otherwise important," intending it to be played more briskly than it has generally come to be performed. The choral lyrics were based on verses about the romantic helplessness of man. Fauré's works of the last years of the 19th century included incidental music for the English premiere of Maurice Maeterlinck's Pelléas et Mélisande, a Symbolist play about forbidden love. The work was very popular and also inspired an opera by Debussy, and incidental music by Arnold Schoenberg and Jean Sibelius. From 1903 to 1921, Fauré regularly wrote music criticism for the newspaper Le Figaro, a role in which he was not at ease. It's thought that Fauré's natural kindness and broad-mindedness meant he tended to emphasise the positive aspects of a work and not be critical enough. Fauré was hugely popular in Britain. He visited often and even played at Buckingham Palace in 1908. He attended the London premiere of Elgar's First Symphony that year and had dinner with Elgar afterwards. "I admired him greatly," said Elgar, who tried to get Fauré's Requiem put on at the Three Choirs Festival. By his last years, Fauré was recognised in France as the leading French composer of his day. In 1920, at the age of 75, he received the Grand-Croix of the Légion d'Honneur, a rare honour for a musician. Fauré suffered from poor health in his later years, brought on by heavy smoking. Despite this, he remained available to teach and dispense advice to young composers, including members of Les Six, most of whom were devoted to him. He died in Paris from pneumonia on 4 November 1924 at the age of 79.